Spanish Moss is worked sideways with the edging added as you work each row and beads can be added at the tips. It grows deeper faster than it does wide. It works up best in a solid color or a yarn with long color runs. Work the increase section until you use up half of your yarn and then work the decrease section. Work the body in solid dcs or add a lace stitch pattern every other row to stretch your yarn. 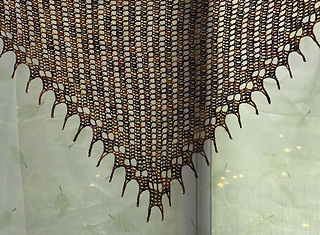 A 420 yard skein of Tosh Merino Light and a size G crochet hook using a lacy stitch every other row made a blocked shawl 56” neckline x 25” deep at center back. 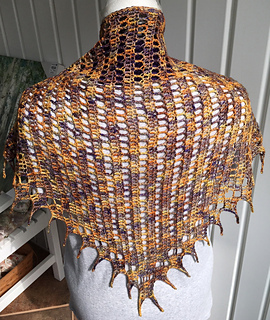 The more yarn you have, the bigger the shawl. Make it with any weight of yarn by changing the hook size to suit your yarn. 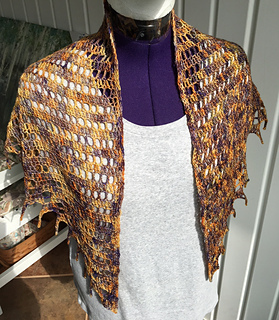 The 6 page pattern includes written instructions (for a solid dc shawl or with lacy stitch additions) and two crochet charts.